Uwell made the vaping community wait an interminably long time between the release of their legendary Crown II and the highly anticipated Crown III, if you were expecting a similarly long duration before the release of the Crown IV… The wait is over - It’s here now! Keeping the best and getting rid of the rest, the incredible Crown IV retains all of the best features of previous generations while enhancing a variety of attributes to make your Crown experience more delicious, simple, and performance-oriented than ever before! With the Crown 4 comes a new series of coils created especially for it! The Quadflow (QF) coil series features exotic element materials, such as super high-grade 904 series stainless and FeCrAl, and an ingenious internal structure that keeps your vapor warm, flavorful and resistant to spitback and leaking. 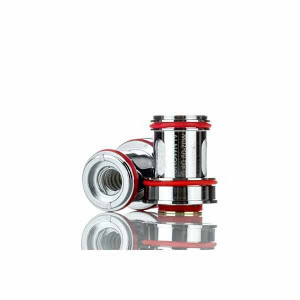 To further combat leaking, the Crown 4 incorporates a completely redesigned base that has been engineered to recycle excess juice that makes its way into the base that would normally leak out of the air holes causing a mess and wasting your juice! If you’ve been a Crown fan from way back, or simply interested in what all the hype is about - Do yourself a favor and get the redesigned Crown IV from Uwell in your cart now!